Diego de la Hoya’s long awaited first career fight in Mexico ended almost as if it never happened at all. The hard luck career of the Mexicali-born contender continues as he was forced to settle for a No-Contest versus countryman Enrique Bernache. A clash of heads ended their bout inside of two-rounds in their featherweight bout Saturday evening at Arena Monterrey in Monterrey, Mexico. Fighting for the first time in nine months, de la Hoya—who is the first cousin of Hall of Fame former six-division titlist and current promoter Oscar de la Hoya—was also debuting in the featherweight division. The move up the scales came out of necessity, as he missed weight to the point of suffering from dehydration ahead of an eventually canceled homecoming last November in Mexicali, Mexico. Left behind was the disappointment of a title shot that was well within reach at super bantamweight, but one which couldn’t come in time as he grew out of the division. There’s no way to yet tell how he will fare at featherweight, as just not enough evidence was provided in five minutes of ring time against Bernache (24-12-0-1NC, 12KOs), who did his best to turn a fight into a boxing match. De la Hoya was well equipped for his opponent’s survival style, along with the manner in which he normally fights on the inside. The unbeaten boxer thought he had it figured out—until he didn’t. A body shot from de la Hoya prompted Bernache to attempt to clinch. His left hand pulled de la Hoya’s head forward just enough to produce a clash of heads which left him with a deep and lengthy cut across the middle of his forehead. “I didn’t feel it, but we clashed heads,” de la Hoya (21-0-0-1, 10KOs) noted afterward. “I looked up and he was bleeding everywhere. Like I said I didn’t feel it at all. Time was called to examine the wound, but the ringside physician went through two thick pieces of gauze very quickly in efforts to contain the bleeding. It was enough to inform the referee that there wasn’t any more boxing to be had in the bout. The contest was officially stopped at 2:25 of round two. The bout was his first since a win in June, which was supposed to lead to a super bantamweight title shot. 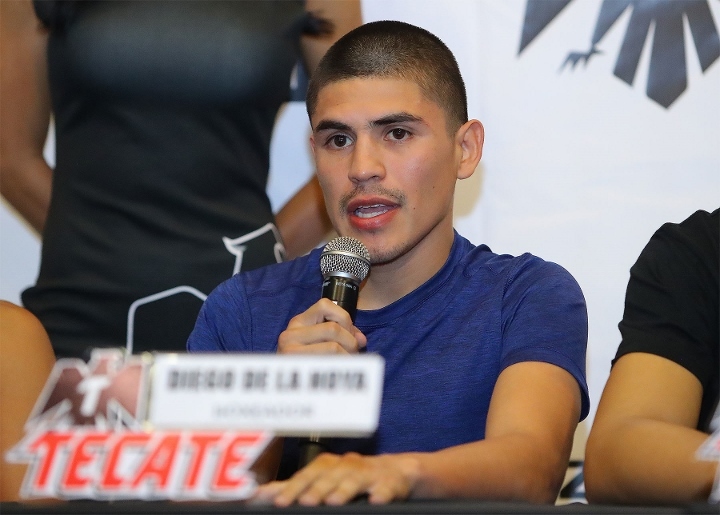 Efforts to get him in the ring for a fight in Mexicali last November instead ended with his spending the weekend in a hospital to be treated for dehydration. With his first fight of 2019 ending in anti-climactic fashion, the goal is to get right back at it.